The Butterfly, by Emily Bronte I've just finished transcribing Sue Lonoff's translation of Emily's Belgian devoir entitled 'Le Papillon' ('The Butterfly'). I've transcribed the translation rather than the original French this time so that the anglophone readers of Bronteana can enjoy some of Emily's work as an essayist as well. I will transcribe the French at a later date. The transcript is available here. I have also begun to scan the rest of the illustration I have for Villette, and these will soon be appearing on the site. Thereafter, I have some for Shirley, The Professor, and Jane Eyre to add in time. Le Papillon is my favourite of Emily's devoirs, at least of those I have read so far. Here are a few excerpts from the transcript: In one of those moods that everyone falls into sometimes, when the world of the imagination suffers a winter that blights its vegetation; when the light of life seems to go out and existence becomes a barren desert where we wander, exposed to all the tempests that blow under heaven, without hope of rest or shelter– in one of these black humors, I was walking one evening at the edge of a forest. It was summer; the sun was still shining high in the west and the air resounded with the songs of birds. All appeared happy, but for me, it was only an appearance. I sat at the foot of an old oak, among whose branches the nightingale had just begun its vespers. "Poor fool," I said to myself, "is it to guide the bullet to your breast or the child to your brood that you sing so loud and clear? Silence that untimely tune, perch yourself on your nest; tomorrow, perhaps, it will be empty." But why address myself to you alone? All creation is equally mad. Behold those flies playing above the brook; the swallows and fish diminish their number every minute. These will become, in their turn, the prey of some tyrant of the air or water; and man for his amusement or his needs will kill their murderers. Nature is an inexplicable problem; it exists on a principle of destruction. Every being must be the tireless instrument of death to others, or itself must cease to live, yet nonetheless we celebrate the day of our birth, and we praise God for having entered such a world. BBC 7 will begin broadcasting Villette next week which can be heard via http://www.bbc.co.uk/bbc7. Thanks to Aidan, my Cornish correspondent. As I updated my blog, looking at the image from the UMaryland production of the Jane Eyre musical, a had a vague sense that I had seen this all somewhere before. It didn't really have time to bother me before I realised what was so familiar about the actor playing Mr Rochester- he looks like Constantin Heger. No really. See? That's M. Constantin Heger on the left, and James Gardiner on the right (from the photo by Stan Barouh). 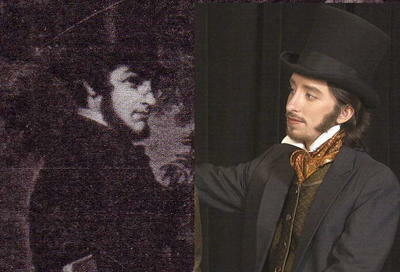 The image on the left is a detail from a large photocopy a friend sent me of a portrait of the Heger family. M.Heger was Charlotte Brontë's teacher while she was studying abroad in Belgium at the Pensionnat Heger. It's my understanding that she based much of Mr Rochester's character on monsieur. They certainly both have a penchant for cigars and bonbons at any rate 😉 And it goes without saying that he is the model for the fabulous Paul Carlos Emmanuel, of Villette. I've always wanted to know more about him, but the books I have on hand have been printed in the 1890s and it looks like there had been some censorship going on. Over and over again it is asserted that Charlotte was never in love with the married Heger, but obviously many believed this was so. What the current evidence for either case is, I don't know not having any more recent works for comparison! The 1970s Yorkshire TV mini-series The Brontes of Haworth certainly asserts that she was in love with Heger. So my guess is that the letters she wrote to him have been widely published, and I just haven't come in contact with them yet.